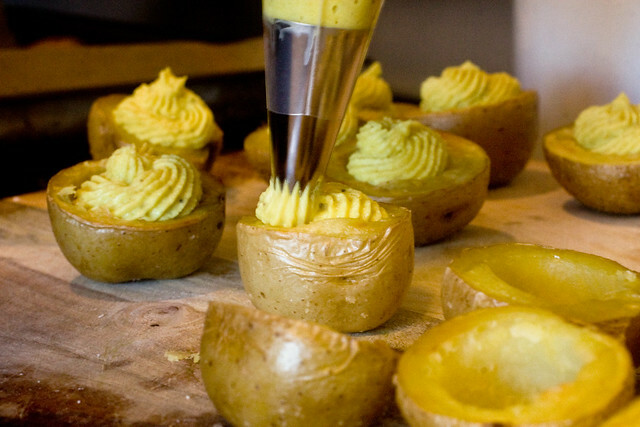 A tender roasted potato with a creamy, eggy filling. Sprinkled with a little paprika and a sprig of dill, they taste as irresistible as they look. 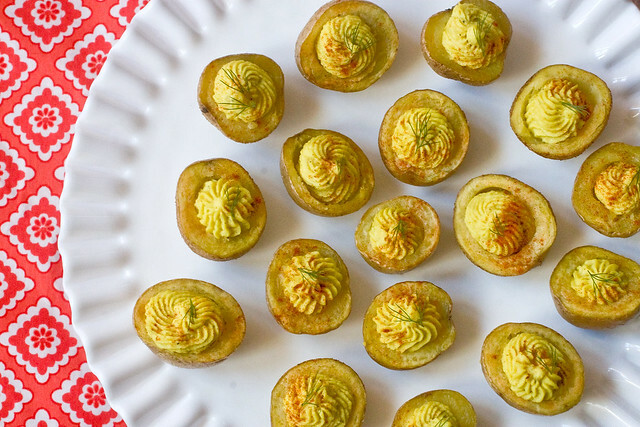 My first meeting with deviled potatoes was when my friend Lauren made them for an Omaha potluck. And of course I came to expect an inviting trayful at all subsequent potlucks. But then Lauren moved away and I was stuck staring at a tray of…nothing. Only my own tears. The recipe she used (and I think most people use this one) is from VegWeb, called Potato Angels. Awww! I wanted to make a version that would be perfect for Passover or Easter. Pop them into one of those vintage egg trays and impress everyone. ~A little black salt, called kala namak, is used for the eggy flavor, but you can use regular old salt, too. Just reduce the amount to 3/4 teaspoon. But kala namak is a really fun ingredient, and great in tofu egg salads, or vegan omelets, so pick some up at a specialty shop or order it for good times. ~I actually didn’t have a vintage egg tray, so I cut off just a tiny sliver of potato at the bottom, to prevent wobbling. But a little wobble isn’t going to hurt anyone. ~Try to find egg-shaped yukon gold potatoes that are all as close in size as possible. As you can see from the pic, they aren’t going to be totally perfect, but that adds to the cuteness. ~Use a jar of ground black pepper instead of fresh ground black pepper. I dunno, it just kind of adds to the authenticity! ~If you don’t have a pastry tip you can slice off the corner of a plastic bag with a 1/2 inch slit and pipe the filling in that way. Alternatively, you can use a rounded tablespoon to scoop it in. But get a pastry bag and pastry tip (I used Wilton 4B), it’s fun! Slice potatoes across the waist and place on baking sheet. Drizzle with olive oil and sprinkle with a pinch of salt. Rub potatoes to coat, and place cut-side down on the baking sheet. Bake for 30 minutes, until potatoes are tender. In the meantime, drain the cashews and place them in the blender with vegetable broth and turmeric. Blend until completely smooth, scraping the sides of the food processor with a spatula occasionally to make sure you get everything. This could 1 to 5 minutes depending on the strength of your blender. When potatoes are tender, remove from the oven. When cool enough to handle, but still hot, scoop the centers out with a melon baller or rounded teaspoon, leaving about 1/4 inch lining of potato inside. Place the scooped out potato into a mixing bowl and mash until smooth. It’s important that they’re still warm so that they mash well. Add the cashew cream mixture, salt, lemon juice and black pepper, and continue to mash until well incorporated. Chill in the fridge for about 30 minutes so that the mixture stiffens up. Once cool, scoop into pastry bag fit with a medium sized serrated tip (I use Wilton 4B) and fill potatoes. Sprinkle with paprika and top with a little sprig of thyme. Keep chilled until ready to serve! These taste best at room temp, I think. Enjoy! Holy moly I am stoked to make these. These are ridiculously cute! I love this idea. Hope to test this out for Easter. These look very yummy. I see a trip to the produce market in my future to pick out some small yukon gold potatoes. My husband is allergic to cashews. The VegWeb recipe calls for vegan mayo, so try that! Otherwise, almonds can work. But they need to be blended like crazy. I’ve used white beans before and it worked. These look so awesome! Plus they’re the perfect vegan substitute to Gilmore Girls-esque shenanigans! Omg. In my pre-vegan days, I was a deviled egg FIEND. These are adorable and I’m so excited to give them a shot for our Easter gathering! (And additional non-Easter gatherings). What a fantastic idea, my son loves deviled eggs. I think these will be an even bigger hit! i have made the potato angels recipe for a few parties and i recommend throwing in an extra potato or two to ensure you have enough filling! I love these, who knew potatoes could be such a show-stopper?! On a side note..I must plant dill this year- amazing stuff! Amazing! You have answered my soul’s call! 🙂 Passover will never be the same again. Oh my gosh! YAY! These look so amazing! I’m really excited that there are recipes posted more frequently, too! This looks amazing! Are the cashews raw? I have been looking for something like this for years, I just didn’t know it. Thanks for bringing it to my attention. These look amazing! I was just looking for vegan hors doeuvres recipes too! SO CUTE! And REALLY kosher for Passover!! Nicely done! Do you think raw sunflower seeds would work? Looks great! I’ve actually always hated deviled eggs. I love food, but I’ve never been able to get over the texture of hard-boiled eggs. These look like an amazing alternative! And just a heads up, you use dill in your recipe but say to garnish with thyme in the directions. 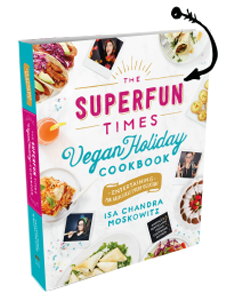 Thanks for inspiring a novice vegan to get creative! those are soooooo cute! I want them RIGHT. NOW. Love these! My daughter loves deviled eggs so i will have to try these on her. i’m glad you’re posting so many good eats again! i was working at the ecopolitan when you stopped by during your traveling times, but was too much of a wiener to do anything but not say hello. so, hello, and i’m amped to play with your most recent ideas. I swear you’re a mind reader. I just told my hubby I needed to find an alternative to the deviled egg…a family tradition…every holiday. You came to my rescue. Thank you…again! Made these last night for my (non-vegan) family, and they wouldn’t stop raving. Will definitely be making these again next week for Easter! I made these yesterday, and they are delicious! We couldn’t stop eating them! This is such a super-creative recipe! I’m excited to make this one day. This could even work as a main course with a larger potato, served with a salad or soup on the side. I made this recipe today, not knowing what to expect – first time using cashews in a dish other than cashew milk and first time trying kala namak. The potatoes were incredibly delicious, everyone who tried them loved them. It sure looks like this will be a regular dish for special occasions. Thank you so much for sharing the recipe! Fantastic idea, and a bit fun and retro. They look like something I remember seeing in one of my culinary training textbooks. And I love how simple they are in the making, so that you have enough time to spend presenting and assembling them. The filling looks so deliciously versatile.. and paired with something as delicious as baked potatoes, who could say no?! I will definitely try this! I’m curious though…no mustard? I’m sure I’ll adapt the recipe a few times, but there must be mustard. I don’t have black salt, but I do have The Vegg. Do you think adding a teaspoon of the blended Vegg will add the needed sulfur/eggy flavor? Can’t wait to try it!! And I am not even a Vegan, well yet……this could be the recipe that flips me to the other side….woot!!! Just curious….does everyone agree to serve at room temp? I would have thought warmed would be the best but since I am making it tomorrow for tomorrow….no time to try both ways so need advice. I’m planning on making these tomorrow, but I couldn’t find black salt. Any suggestions for another way to get that eggy/sulfur taste? Nah, that’s really the only (vegan) way. But it will still be so yummy! Add a teaspoon of mustard, as another comment suggested. Whenever I find a recipe I might like, I go right to the reviews to get the low down. Well, ok, you have never let me down in the 6 years I have been cooking w you, but still…. So it drives me crazy when everyones all “That looks good,” “Good idea,” “Ohhhh I gotta make this,” but nobody has actually eaten it. Well, lemme tell ya, I made these tonite for our Easter dinner with the most anti-vegan food eater I know and he (and we) said it was the best meal he has had. We served it along with your Chesapeake Tempeh Cakes, flat green beans, remoulade, and generic dinner rolls. There were no left overs. 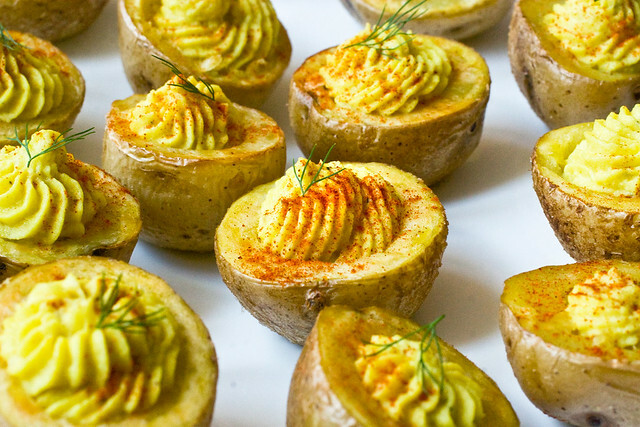 These little devilish potatoes were most loved. Thank you for all the recipes which become our family meals, holiday menus, etc. You never fail to wow my tastebuds. Thank you! Thank you! And I personally love when people say “looks good” etc, because, I dunno, it’s exciting and makes the work seem worth it! Sometimes no one comments and, as the author, you’re all “what’s wrong with the recipe?” But I love the reviews, too. I just made a batch with purple fingerling potatoes and I’m ridiculously excited to bring them to a family function tomorrow. I have the filling in the fridge setting, but I had to try it already and it is delish! I added horseradish for an extra kick (and because my mom always made deviled eggs with it). I tried the potato angel recipe on VegWeb but as good as it is I’ve never been crazy about it because it uses the processed mayo. Thank you for a more natural alternative! You rock! Oh, my, goodness! These are really good and unbelievably easy. So good and so worth the energy!!!! Thank you for posting this! I thought these were adorable and couldn’t wait to try them. I made the recipe with a bag of baby potatoes and they turned out great! The recipe was pretty easy (less work than devilled eggs ever were) and quicker with the baby potatoes (they only take 15 minutes in the oven). They were a hit at our Easter brunch. I made these for Easter- adorable and everyone loved them! Thanks so much. I made these yesterday and they were very good. I didn’t have turmeric, but they looked great with white filling! I used broth (add gradually!) and added a little nutritional yeast and porter brown mustard (the filling was still white), but I think the filling would have been great with just water or almond milk instead of these. I topped with paprika, fresh dill, and thinly shaved radish. I will be making more variations of these in the future. Thanks, Isa!! These are really good! And so cute 🙂 Thanks again Isa for a splendid recipe! Made these last weekend and they were my saving grace when I was missing my Easter traditions around eggs. THANK YOU! I made these for “Easter.” They were delightful and growing up I adoooooored deviled eggs. My husband forbid me from making these again because we just stood around eating them…. which, while I thought was the point, is apparently NOT the point. Anyway… I think that next time I make them, to make them a little closer to the deviled eggs of my childhood, I’m going to add a touch of yellow mustard and some sweet relish. I’ll probably also soak the cashews overnight because I’m not sure the two hours was enough. My black salt came in the mail and I made these today. Tastewise, I hit the mark. It was also going to be my first go at using a pastry bag; which has been sitting my my kitchen drawer for….years. Complete fail there, as my mixture did not go through the nozzles. I’m thinking that next time I’ll run my hand mixer through it. Otherwise, these are absolutely epic! yumm yummm! Really delicious! My filling turned out a bit thin, guess next time I will play a bit with the broth instead of adding all at once, but they taste really good! Do you think these could be made the night before an event or would it be better to make them the day of? Made these last week and they were delicious!! Can’t wait to try this once I can go get more!! These are incredible! I made them this week for a potluck at work and they went over amazingly well, everyone loved them. I don’t have a piping bag (I am getting one at the store today!) so I just used a regular old plastic bag with the corner cut off and it worked great. I also added a teeny sprinkle of curry powder and some parsley and chives for color. Beautiful recipe! These were delicious, but I had a terrible time getting the filling through the pastry tip, though I mashed as well as I could beforehand. Next time I’ll use a) a potato ricer? b) the food processor? or c) a much bigger pastry tip. Made these tonight just as written, including piping the filling. ADORABLE and delicious! Another terrific recipe, Isa. Thank you! My friend made these and we assembled at my house. Wow! They are completely irresistible! I have a question – What parts do you think can be done ahead? I’d like to make them but want to have them ready to enjoy so I am not cooking during my own party. You can use vegan mayo instead. I don’t know, maybe 1/2 cup? I made these today. They were wonderful! I’ll be making them again soon! Yay! I volunteered to bring a vegan app for my roller derby team fundraiser. I’m gonna SO give these a try! Deviled eggs without the post-eating obnoxious bedroom gas afterwards! The Devil Wears Potatoes | Oh My Potluck! Can you make these a day in advance, and store in the refrigerator? Turmeric works really well for an eggy flavor as well! In response to all the people asking if they could make these ahead, I made them one day before a party, put them in the fridge, and sat them out an hour before. They are probably better eaten the same day, but they were still tasty. Oh wow I can’t wait to try these! And to think I almost tossed out my old egg trays just the other day but didn’t for some reason. Thank you, thank you, thank you, for this recipe. It is AWESOME! I really can’t imagine that they would taste as good without the black salt, the eggy flavor and smell really make these like deviled eggs! My daughter loves deviled eggs from her grandmother’s house but we don’t do animal protein at home. I made these and she loves them! It is also a great alternative to the standard PB&J in her lunch. I tried out a bunch of recipes from the ppk this weekend to figure out what to bring to my sister’s for Thanksgiving. These potatoes will definitely be coming with me! They were quick and easy to make (especially since I didn’t bother to make the filling pretty), and they’ll transport easily. And, most importantly, they were delicious! I didn’t have any of the fancy salt, but they were still great with regular salt. I put a little brown mustard in about half of them to try it out. I think I liked them slightly better with the mustard than without, but that’s probably because that’s the flavor I most associate with deviled eggs. Thanks so much for this recipe! I saw Ann Esselstyn do something like this a few years ago and LOVED it! Love your recipe as well!! I made these from the Vegweb recipe a few months ago and they are awesome!! I brought these to a work party over the holidays and they were a big hit with vegans, vegetarians, & omnivores alike! I used a bag of baby dutch yellow potatoes, which turned out really cute! I also ran out of time to find the kala manak, so I used regular salt and added a teaspoon of dijon mustard. Tasted great. I’ll definitely make these again for parties – so much fun. I served these tonight. They look beautiful, but everyone said they were a little bland. I added some fresh garlic and still needs something more. Any suggestions? I made these tonight. I can’t believe how much they taste like deviled eggs, which I have sorely missed. Thank you! I’ve got to say, this is the second year I’ve served these at our Seder and they’re always a hit. Such a good, easy recipe. To the person who said they found them a little bland, I salt and pepper the potatoes generously before baking and it makes a big difference! These look great! I am looking forward to try this out. OHHHHH MY!!!! I am gonna make these…. oh yea i am! THANK YOU THANK YOU THANK YOU! Just made these to take to Easter tomorrow. My mom can’t have eggs anymore, so she might actually try them! I messed up something with the filling because it didn’t pipe out very well and is pretty runny in the potatoes. I also should have trimmed the bottoms of all of the potatoes, because now they’re all falling over everywhere and I have to transport them! I’m hoping the filling firms up over night. The taste is great though, and I guess in the end – that’s what really matters! Not good. I could have just mashed up some potatoes with salt and pepper and a few cashews sprinkled on top and got the same flavor. Not worth the effort or time. Now that doesn’t sound like it would be very fun for guests. I have made these yummy little fellas on quite a few occasions and they are def worth the effort. When I put them out to be eaten I’m lucky if I get one!!!! I made these succssfully, but 3/4 cup of water or broth is way too much! I had a runny liquid! So I added ground flax seed to the blender mixture until the “egg” got thick enough. The filling (with kala manak black salt!) tastes almost exactly like deviled egg filling, with almost none of the ingredients. Amazing. I totally agree Isa, the pastry bag is a blast!! I took a chocolate cupcake recipe and a vegan cream recipe and then added a little bit of “me” in there and came up with the “ding dang!” Cupcake (similar) to Ding Dongs, and used my pastry bag. LOVED IT (and OH those cupcakes!). Cannot wait to try these. Someone made some at a potluck and they were to live for! I got inspired to make these from Isa ‘s Instagram of a Modern Love dish! Made them. Everyone loved them. Fun and easy to make. I used an electric hand mixer to mash potato mixture. I added a tsp of yellow mustard and some finely chpped onion. I recommend searching out the kala manak . I found the salt at the asian food market. If was labeled as just black salt, but is actually pink. Worth the search! These turned out so well! I just spooned my innards directly and they still looked great (very rustic, actually). I might add a little onion powder next time (I used to add it to deviled eggs back in the day too) but they’re honestly fantastic and only took about an hour from start to finish. Thanks for the non-mayo tweak! Does the kala manak black salt make a difference in the flavor of the recipe? I have made these a bunch of times and they are always a huge hit. My only problem is that the mixture always comes out too wet. I use a Vita-Mix, and mix in the potatoes so I can put it through the cake decorator Pampered Chef thing. Any suggestions? I have mixed in potato flakes and that has worked but I am unclear about the quantity to add. Made these for a party. There was not one left. Almost none of the filling made it into the potatoes because I was too busy eating it right out of the bowl. I’ve not made these, but I’ve had them at the restaurant. Very pleased to find the recipe online and will be making them for New Year’s Eve!